Property Size 696 sq. ft.
Rio Cabana. . . in a word, CHARMING. 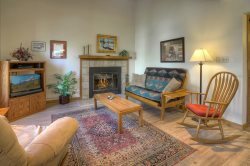 The beautiful mountain cabin sits on 2 acres just 15 minutes outside of downtown Durango. Just 30 feet outside the front door is the Florida River with excellent fishing. Cutbow trout, Rainbow trout, and German browns are all abundant in the cool waters. Try your hand at fly fishing at more than 450 feet of river frontage. Catch and release only! Or, let the kids catch a trout in the stocked pond in the front yard. Recently remodeled, the cabin sleeps five comfortably. The master is furnished with a queen sized bed. In the living area, there is a twin sized bed, and a queen futon. One full bathroom. Pull up a chair on the porch and spend a lazy afternoon, or check out all that Durango has to offer.